As I discussed last weekend, the cherry pie I made used less than half of the cherries I had bought. So of course I had to make something else with cherries (I didn’t want to make the same pie twice — that would defeat the purpose! 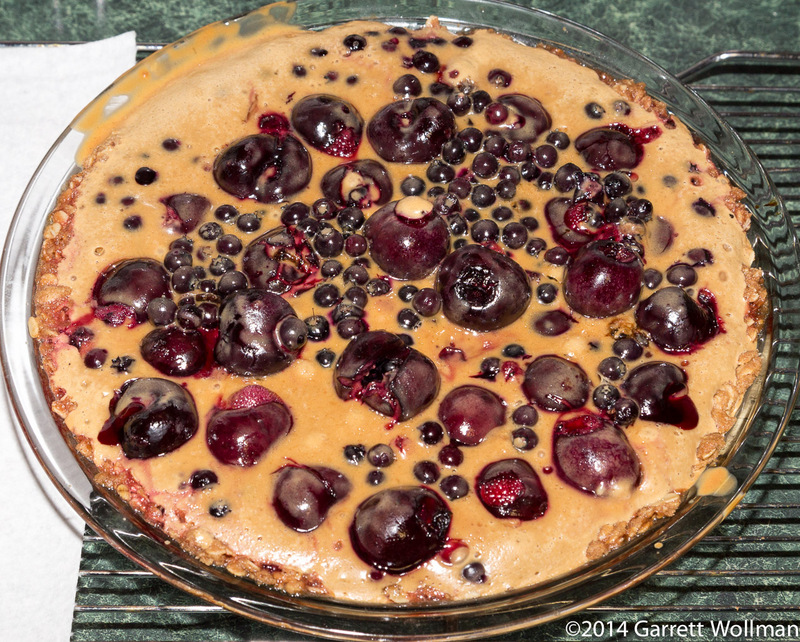 ), so I looked in the index of the Four & Twenty Blackbirds Pie Book (the same book as the recipe for last week’s pie came from) under “cherries”, and saw the intriguing “Cherries and Cream Pie” was on page 122. I was a bit puzzled because I thought I would have seen this recipe when I scanned the cookbook for interesting recipes last time, but figured I’d give it a try anyway. When I got to page 122, I saw why I hadn’t noticed it: the recipe was for “Peaches and cream pie”, and it said absolutely nothing anywhere about cherries. There was an oblique note on the side that said “This recipe is equally delicious with any ripe summer fruit”, but it gave no hints as to how any other fruit ought to be prepared or if any other recipe adjustments were required. Still, I had a pound and a half of cherries, and this recipe could use a pound of them, and hey, Prunus. 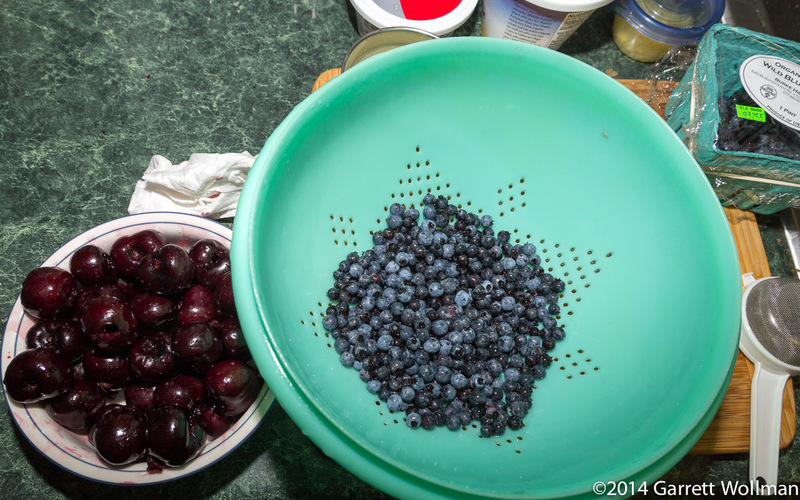 After going grocery shopping, I also ended up with a pint of fresh lowbush (“wild”) blueberries from Maine, and figured I could add some to help fill in the rather large voids left between the cherries. It didn’t really work out the way I would have liked. I clearly had too much fruit, and after cutting out a slice, it was clear that there was too much liquid and the “custard” part of the filling had not completely set. My crust was also much thinner than the authors’ and had holes in some spots. 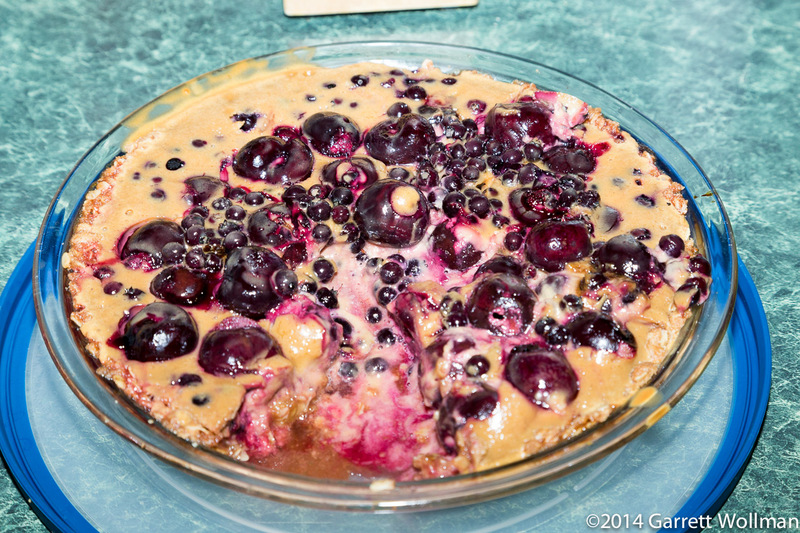 It still tasted good, and it was lower-calorie than the regular pastry-crust cherry pie I made last by a good margin. But I won’t be trying this one again (at least not in this variation) without a proper recipe. 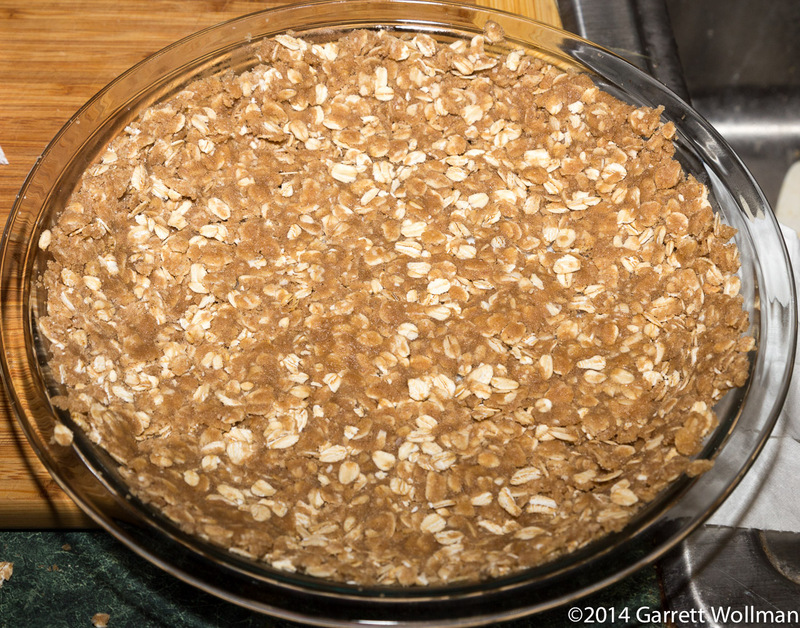 This pie uses an oat crumble crust, which is made from flour, oats, sugar, spices, salt, and (of course) butter. 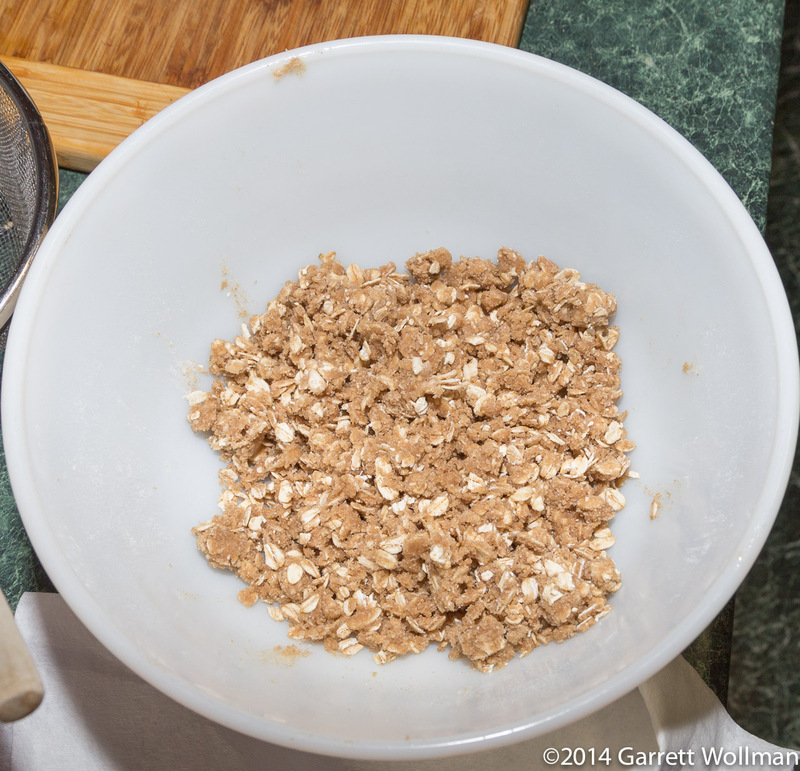 The oat crumble is mixed by hand to form a clumpy, amorphous mass. The crust has been pressed into the pie plate and is ready to be blind baked. Unfortunately, the crust recipe did not make quite enough, so there are a few spots where there is insufficient coverage of the pie plate. After baking, the crust looks pretty much the same as it did before, except that it’s now dry and brittle rather than moist and plastic. There are still some pretty obvious gaps despite my best efforts at shoring it up. The pie filling is a two-part construction, with a “custard” (made from sour cream, cream cheese, sugar, and an egg) combined in the pie crust with the fruit-lemon-sugar mixture that forms the bulk of the filling. Obviously the filling was a bit too bulky. 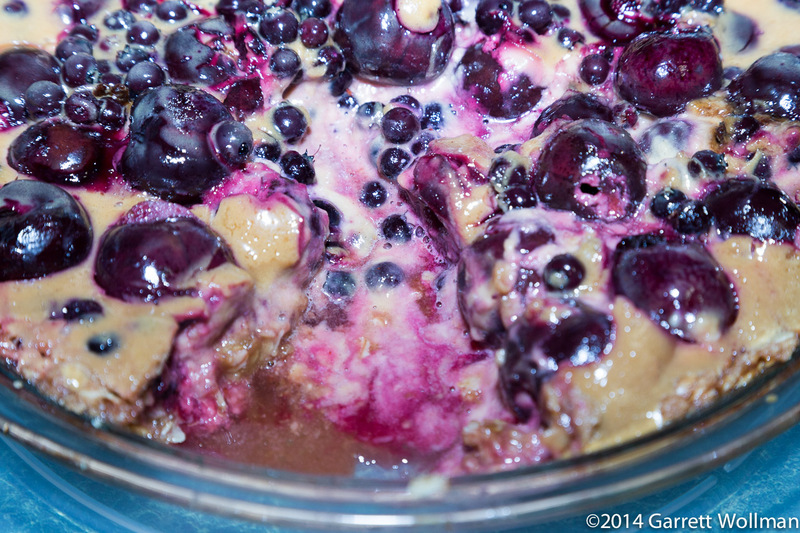 Not sure what I should have done here — just less fruit, or more blueberries and fewer cherries, or maybe cut the cherries in half and mix the blueberries with the “custard”? 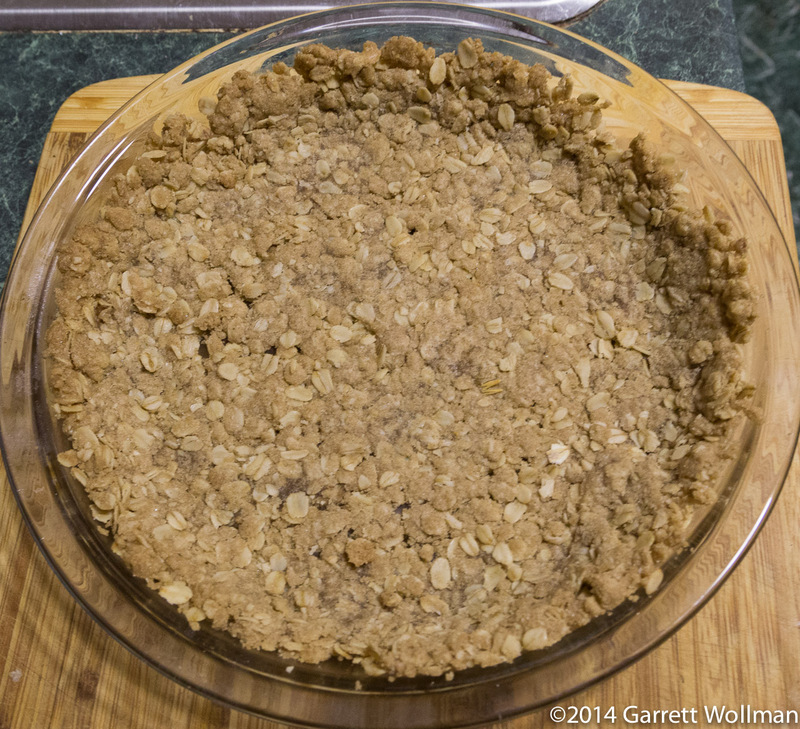 And of course the oat-crumble crust was just not quite enough to hold back the filling all the way around. Thankfully it did not ooze out onto the sheet pan. OK, I think this is cooked… time to let it cool! I guess it wasn’t quite cooked enough, as the filling was still a bit runny. No matter, it’s all coming into work tomorrow and I’m sure they’ll still eat it! 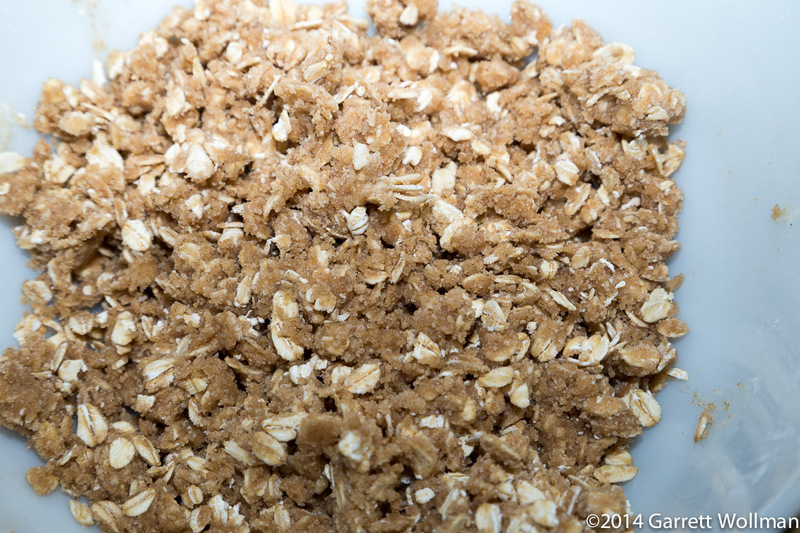 Hmmm, a lot of water there… Perhaps this recipe needs a bit more adjustment. Since this was a bit of a one-off, I’m not publishing any nutrition data. 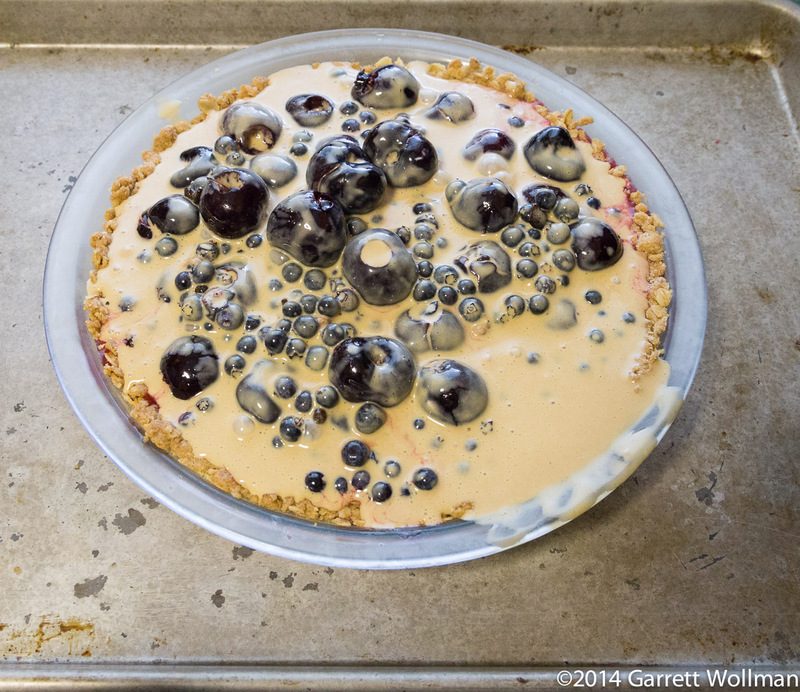 Gallery | This entry was posted in Food and tagged blueberries, cherry pie, recipe. Bookmark the permalink. The creamy dreamy pie is driving me crazy, I’m adding some pistachios to this, hope that’s fine….